1. There are no products with an EIQ of zero. This is very important. All products used in our gardens have an impact on the environment. Insecticides, miticides and fungicides are all "cides" which means they are intended to kill the target organism. The best pesticide or at least the one with the least environmental impact is no pesticide at all. Dr. Gillman emphasizes this in his discussion of environmentally-friendly cultural practices such as soil enrichment and organic fertilization to grow strong healthy plants, the maintenance of cleanliness and good air circulation, the selection of disease-resistant cultivars, the use of mechanical approaches to pest control such as water and hand-picking, and the encouragement of beneficial organisms. Good horticulture is the first line of defense and must be practiced before selecting any chemical for use in the sustainable rose garden. 2. The EIQ does not consider the effectiveness of the chemical. Some pesticides are more effective than others. The EIQ treats them all as having the same effectiveness. Those who have gardened for many years know the effectiveness of a chemical often depends on many factors, including, for example, the build-up of resistance. The sustainable rose gardener will have to consider the EIQ in light of his own experience, remembering that an ineffective chemical still has a negative effect on the environment but without any corresponding benefit. 3. The Signal Words have little correlation to the EIQ. As can be seen from the chart, nearly every chemical commonly used on roses has a Signal Word of "Caution." That is the lowest or "safest" of the three words. There are a few marked "Warning" or "Danger" which as a general rule have higher EIQs than those marked Caution. The toxicity of a chemical and its danger to its applicator is one of the factors considered in the calculation of the EIQ. But as can be seen, there is little correlation between these toxicity indicators and the overall EIQ. 4. "Organic" products may or may not have less impact on the environment. In the case of the insecticides, it will be seen that the five with the lowest EIQs all have OMRI listings. Of the fungicides, the one with lowest EIQ is generally considered organic, while the one with the second-lowest EIQ has an OMRI listing. And so it initially appears that the OMRI listing and organic products have lower EIQs and are less harmful to the environment. But there are exceptions. We find rotenone, a natural pesticide that Dr, Gillman particularly dislikes, having a higher EIQ than Sevin, Orthene or Malathion, all synthetic chemicals unfavored by organic gardeners. We also find the OMRI-listed sulfur as having the next to highest EIQ among fungicides, exceeded only by the supposedly natural, but toxic brew called Bordeaux mixture, which has been around for many years. 5. Field comparisons should not be made with these data! But this is not all folks there is something else about these figures that I discovered in reading the article THE EIQS NEED TO BE ADJUSTED IN ORDER TO COMPARE THEM! The original article on the EIQ contains the following statement with the bold letters in the original: "Field comparisons should not be made with these data." What this means in its simplest terms is that you cannot use the total EIQ numbers to compare chemicals. Dr. Gillman's emphasis on selecting chemicals with an EIQ of less than 25 is intentionally oversimplified. In fact, tabulating the data as I have done is wrong. "Once an EIQ value has been established for the active ingredient of each pesticide, field use calculations can begin. To accurately compare pesticides and pest management strategies, the dose, the formulation or percent active ingredient of the product, and the frequency of application of each pesticide need to be determined. To account for different formulations of the same active ingredient and different use patterns, a simple equation called the EIQ Field Use Rating was developed. This rating is calculated by multiplying the EIQ value for the specific chemical obtained in the tables by the percent active ingredient in the formulation by the rate used." This makes sense if you think about it for a few moments. The environmental impact of a chemical must depend on how much of it you put in your garden. Chemicals have different percentages of active ingredient, different rates of application and different recommended frequencies of application. The EIQ Field Use Rating adjusts for these factors thus permitting real comparisons of the environmental impact between pesticides. 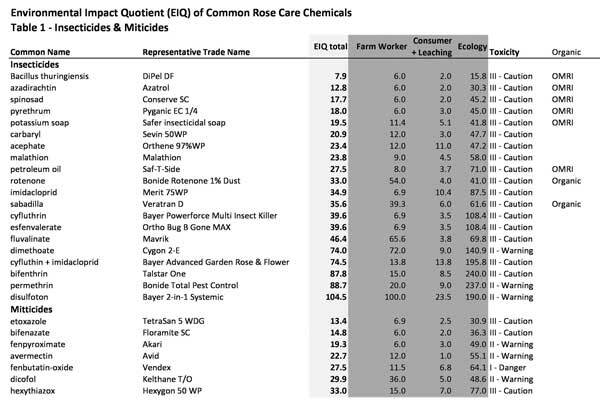 The EIQ Field Use Rating of commonly used rose chemicals is set forth in Tables 3 and 4. There I have adjusted the EIQ by the percentage of active ingredient (ai), the dosage (based on ounces/gallon) and the frequency of application. The latter simply assumes a standard of 16 applications in a season for those chemicals applied weekly, with corresponding adjustments for those that are applied every 14 or 21 days. This provides an accurate relative comparison that should remain roughly the same, no matter how long the growing season. I have referred to the EIQ Field Use Rating thus obtained as the "Ros-E-IQ" though unlike the measure of intelligence, a lower Ros-E-IQ is better. These values contain a number of surprises. With respect to the insecticides, the three chemicals with the lowest Ros-E-IQs all have OMRI listings. At the same time, the two chemicals with the highest Ros-E-IQs also have OMRI listings, these being petroleum oil and insecticidal soap. Both have very high rates of application and high percentages of active ingredient, which, as can be seen pushes their ratings very high. A good break point in evaluating the Ros-E-IQ is 25 the number used by Dr. Gillman though in this case the number has considerably more relevance. And of interest, we find a number of insecticides that organic gardeners would reject out-of-hand, including Bayer's Powerforce Multi Insect Killer and its Advanced Garden Rose and Flower Insect Killer. We also find Mavrik and Talstar both of which have very high EIQs, primarily because of their ecological effects, however because of their low doses they have low Rose-E-IQs. We also find Merit, which contains imidacloprid, the most widely used insecticide in the world, with a low Ros-E-IQ, primarily because it is typically applied at the very low rate of1 teaspoon per ten gallons of spray mix. In the case of the miticides we find the very low application rates on roses give Avid, TetraSan, Akari and Floramite extremely low Ros-E-IQs. Hexygon is also well under the 25 level. In fact, we can see that modern miticides have very little negative environmental impact in the rose garden. Finally, in the case of the fungicides, we find that the product with the lowest Ros-E-IQ is Compass, a product that contains strobilurin, a fungal antibiotic that fights infections of plants. In second position is the new biofungicide Serenade. Of particular note is that the fungicides with OMRI listings or based on so-called "organic" formulations of metals and elements are pretty much at the top end of the values. Those under 25 include Heritage, another strobilurin-based chemical, and well-known fungicides such as Banner Maxx, Funginex, Immunox and Bayer Disease Control. Dr. Gillman's emphasis on EIQ in his book comes up short because he fails to complete his analysis and examine the EIQ Field Use Rating. But his main point is nevertheless valid. Sustainable rose gardening is about making safe and smart choices such as reducing the use of pesticides and increasing the use of mulches and compost. And, when it becomes necessary to utilize a pesticide, we do have choices and can select those that have a substantially reduced impact on the environment. The EIQ Field Use Rating provides this value, which in the case of roses is the Ros-E-IQ. My objective in growing roses is and has long been to grow and show -- the best and most beautiful roses. In so doing, I am convinced this can be accomplished without sacrificing the environment. We need to adopt sustainable rose growing practices. Hopefully this study will contribute to our knowledge of how we can minimize the environmental impact of the chemicals we use on our roses so that our roses are not only beautiful but also contribute to a beautiful environment. © Copyright Robert B. Martin, Jr., all rights reserved. The Rose is the most beautiful flower in the environment and rose bushes have diverse uses in the green landscape. But the public's interest in rose gardening is changing. Americans continue to love roses, but many now want to grow them in an environmentally responsible manner. This changing attitude has led to a growing interest in sustainable rose gardening. Sustainable rose gardening is managing our gardens with minimal effects on the environment. A sustainable rose garden is one that is adapted to and managed without extraordinary demand for chemicals and care while maintaining a healthy balance and emphasis on healthy soil. It is somewhat different than what has become known as "organic gardening," with its emphasis on natural approaches to feeding and pest control. This emphasis is good, but we have also learned that "natural" does not necessarily mean "safe" and that nature itself produces many highly dangerous chemicals. A healthy balance also implies that we scientifically weigh the environmental risks and benefits of any gardening practice without regard to whether it is "natural." "The Truth About Organic Gardening"
This latter point is emphasized in a recent and interesting book by Jeff Gillman, titled "The Truth About Organic Gardening". Dr. Gillman is an associate professor of horticultural science at the University of Minnesota and holds a doctorate in horticulture as well as a master's degree in entomology. Although he is largely in favor of organic gardening, he believes that organic gardening should be about making safe and smart choices such as reducing the use of pesticides and increasing the use of mulches and compost. He is also concerned that it has come to mean making "natural" choices, include the acceptance of natural pesticides with significant problems. In this book, he considers over 100 gardening products and practices organic and synthetic and examines each to determine whether it is safe and effective. In evaluating pesticides, Dr. Gillman considers it useful to examine its EIQ the environmental impact quotient. The EIQ is an idea pioneered by Joseph Kovach and his colleagues at Cornell University in the early 1990s. Seeking to establish a standardized way to look at pesticides to determine their relative dangers to humans and the environment, they calculated a number that estimates the environmental impact of a pesticide by taking into account toxicity to natural enemies, wildlife and humans, degree of exposure, aquatic and terrestrial effects as well as soil chemistry. The numbers range roughly from 10 to 100, the higher the number the greater the negative environmental impact. Dr. Gillman observes: "EIQs aren't perfect, but they're the only way I know of to provide a single coherent value that summarizes the potential risk a chemical application poses to both the environment and us." He therefore cites the EIQ in assessing various chemicals and prefers those with an EIQ of less than 25. The original published article on the EIQ titled, "A Method to Measure the Environmental Impact of Pesticides" is available on the Internet along with a downloadable Excel file showing the current calculation and EIQ of numerous pesticides and other chemicals. Being impressed with Dr. Gillman's book, I had thought it might be useful to segregate those chemicals commonly used in rose gardening into tables that rank their EIQ for the benefit of rose gardeners seeking to reduce the environmental impact of chemicals used in their gardens. The result of my study is set forth in Tables 1 and 2. 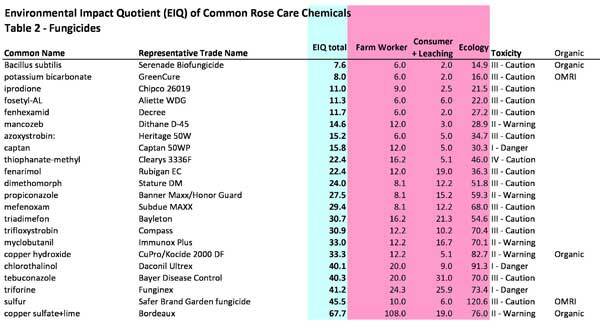 There I show the overall EIQ of common insecticides, miticides and fungicides, both natural and synthetic, used in rose gardening, including the three separate elements from which the EIQ is calculated. The chemicals are then sorted by increasing overall EIQ. I have also added the Signal Word contained on the label of the representative chemical as well as the words "OMRI" and "Organic" where applicable. OMRI refers to the Organic Materials Review Institute, which provides an independent review of products intended for use in certified organic production. Acceptable products are OMRI Listed® and appear on the OMRI Products List. The word "Organic" is used in the case of products not found on the OMRI list but typically provided by suppliers of organic products and considered "natural".